GLOBAL SOUNDSCAPES FESTIVAL: Hands On! The Vancouver Inter-Cultural Orchestra (VICO) is proud to announce the 2017 edition of its annual Global Soundscapes Festival, taking place from June 6-11 at The Revue Stage on Granville Island. The focus this year: the beat of the drum. 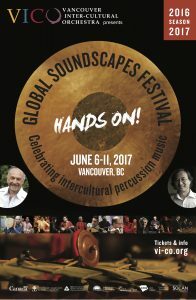 The VICO will host special guest soloists from China, Iran and Montreal, alongside a who’s who of BC-based percussionists and other musicians from Vancouver’s vibrant world music scene, for six days of concerts, workshops and other events. Buy a VICO Flex Pass & save on Festival tickets! Join us for some music without borders! Music of the Whole World: Hands On! The beat of the drum is primal & universal, but different cultures have developed fascinating variations on the theme. Learn about how VICO composers & musicians combine & intertwine them to create new intercultural music! With Hamin Honari (tombak), Navid Goldrick (oud) & Curtis Andrews (mrdangam – May 30 only). At the Revue Stage on Granville Island (1601 Johnston St.) unless otherwise noted below. Tickets for all concerts are on sale now, online via Brown Paper Tickets or in person at Neptoon Records (3561 Main St.), Sikora Records (432 W. Hastings) or Highlife Records (1317 Commercial Drive). **Buy a VICO Flex Pass & save on Festival tickets! VanAfrica is a musical journey across Africa, through the traditional music and dance of at least six different ethnic groups and four countries. The group is made up of some of Vancouver’s most exciting practitioners of African performing arts, including: N’nato Camara (Guinea), Kurai Mubaiwa (Zimbabwe), Kesseke Yeo (Cote d’Ivoire), Pasi Gunguwo (Zimbabwe) and Curtis Andrews. Be prepared for intense dancing and drumming as well as intimate songs on rarely heard instruments such as the bolon, gongoma and mbira. 9:30 pm All Hands On! Featuring an improvised solo performance by Ziya Tabassian, a tabla duet by Niel Golden and Shawn Mativetsky with Jonathan Bernard on marimba, and an ensemble performance of “Earthy Airs” by Moshe Denburg (with Brian Nesselroad, Curtis Andrews, Jonathan Bernard, Shawn Mativetsky, Ziya Tabassian, & Daniel Tones).